Pierre-Edouard Batard is Deputy Director General of “Confédération Nationale du Crédit Mutuel". He will be appointed General Director on March 26th. 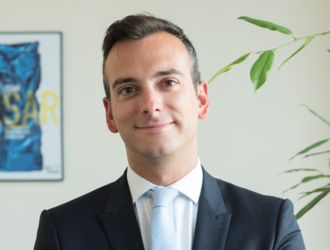 Born in 1984, a graduate of Polytechnic and the National School of Statistics and Economic Administration, Pierre-Edouard Batard began his career on the economic analysis board and worked for several years at the Ministry of Economy and Finance. During 4 years he was adviser then deputy director of cabinet of Michel Sapin, Minister of Labor, then Minister of Economy and Finance. Dear Mr. Batard, as one of the EACB Vice-Presidents and as the Deputy General Director of “Confédération Nationale du Crédit Mutuel”, what kind of challenges and opportunities does digitalisation create for co-operative banks? The development of the intelligent use of digital technology within banks, and in particular co-operative banks, can and must strengthen proximity between banks and members. Such use must heighten the quality of customer service by shortening response times and developing a comprehensive service. This trend must also strengthen the tie between the member and his co-operative, i.e. the affectio societatis. Our members are anticipating a renewed dialogue with their co-operative, its proposals for solutions, actions and social responses. Thus, several banks, such as Crédit Mutuel, are developing social networks intended for members who may express their views freely, exchange their opinions and query their co-operative directly, thus strengthening internal democracy. Nowadays, clients and members want a comprehensive and multi-channel service with extended opening availabilities. In the same manner as in the past, they want quality service. They have good reason to trust their advisor – each of our clients has a dedicated advisor – and they want this advisor to support them in their day-to-day life, but also in the financing of their projects and in connection with the uncertainties and requirements of their daily life. We are convinced that our clients and members are not necessarily seeking to optimise each of the services by selecting different external providers. They are rather seeking comprehensive support. Co-operative banks serve this purpose. One year ago, the Second European Directive on Payment Services (PSD2) came into effect, on 13 January 2018. This instrument, which is aimed at modernising payment services, imposes on banking institutions the obligation to make their clients’ data (of course subject to such clients’ consent) accessible to third-party players such as account aggregators. Over the last few years, a very large number of improvements were made as regards mobile devices. However, this situation might be thoroughly changed with the advent of “open banking”, as banks are obliged to supply connectors (API) by September 2019 [time at which the technical regulatory standards related to the programming interfaces shall come into effect]. Such approach will partly push institutions towards non-financial services, towards the “beyond banking” activity. In this logic, banks no longer help clients only when they need financial services, but banks must position themselves before and after such need arises. This fully corresponds to our co-operative philosophy. This drives co-operative banks to develop technological initiatives, sometimes in-house and sometimes in cooperation with specialised and younger enterprises. We should thus witness a mushrooming of co-operation agreements, whether in an integral operational effectiveness logic focused on technological solutions or for market control purposes. Many co-operative banks have already developed innovative solutions and are among their country’s key players in terms of technological innovation (Crédit Agricole, OP Financial group, Rabobank, etc.). What are your views on the EU Commission FinTech action plan? The Commission’s objective consists in pushing Europe to become a global FinTech centre and enabling EU enterprises and investors to fully capitalise on the advantages offered by the single market. This objective is praiseworthy, and we must support those sound initiatives that drive the financial sector to benefit from the development of new technologies, from the blockchain to artificial intelligence and cloud technology … provided that this is done in the client’s interest and while protecting the security of personal information. The regulatory agenda, which has, in particular, led to a continuing increase in capital requirements, in a manner sometimes contradictory with the supply of credit facilities, is now calling for the opening up of our data systems with the FinTech Action Plan (FTAP). All this – under the pretext of serving clients better. We must recall that our co-operative institutions did not wait for these new guidelines in order to develop IT services or to rely on assisted intelligence and that they are already practicing open banking. In reality, favouring the FinTechs without any reservation, as certain persons would like to do, would mean opening up banking data to the GAFAM companies. We may then have misgivings as to the actual benefits derived by clients and by our European economies which would then be dominated by non-European players. Moreover, there is a contradiction between the opening up of data, advocated by the FTAP and the position stated by our governments to maintain a network of agencies, ATMs and services throughout our regional territories, while FinTech companies will not assume this role. Finally, the question of the open use of client data clearly raises the issue of the security of such data, when banks have always worked, under the regulator’s authority, for the proper protection of the clients’ property, assets and information, which is the mainstay of a real trust relationship. In this respect, we must be highly vigilant as regards the creation of a pan-European label under which platforms that have been approved in a given country may exercise their activities throughout the European Union. Indeed, we must avoid that these platforms may be the under-regulated trojan horse that destroys the basis of clients’ trust that had been patiently built up by our institutions. Also, it is surprising to oblige some entities to open up their data, while the same obligation does not exist in other countries or in other sectors that are potential competitors. Finally, what are Crédit Mutuel’s initiatives on digitalisation? More than ever, our development focus remains our technological expertise serving our clients. Technology never serves a virtual and de-humanized relationship, but on the contrary allows for an “enhanced” relationship between the advisor and his client. To that end, the choice made by Crédit Mutuel first relies on local banks fully responsible for their operations, where all clients have a dedicated advisor that they may contact by email, chat, videoconference, etc. and that they are also able to meet with in the branch. While Crédit Mutuel is fond of technology, the Group as a whole is centred around human values, with client relationship managers who thus remain the prime contact persons of members and clients. Insofar as it is concerned, Crédit Mutuel is already responding with a diversified offer: banking insurance, but also real estate (we are the leading telephone-based real estate agency for new properties), telephony, home protection, etc. We are already monitoring, with great attention, the new services and are already partners of numerous FinTech companies (aggregator, crowdfunding, electronic kitty funds, etc.). However, by proposing directly for more than ten years multiple high-tech services, the Crédit Mutuel Group appears to be a pioneer. We have anticipated the paradigm change that was under way in the banking community, well before the emergence of the new forms of competition and the development of the fully digitised bank. For instance, CM Arkéa developed Max, an open aggregator, and integrated several FinTech operators. Since it decided to use the Watson AItechnology, in cooperation with IBM in 2015 (see below), CM Alliance Fédérale developed a consulting support environment and created jobs and a Cognitive Factory in Strasbourg which is developing new tools for serving clients. By using technology, all of our agencies and points of sale are interconnected via high-throughput links to our support platforms. Thus, our advisors can fully take care of our clients. Our enterprises have developed an internal IT design function, created new tools and offered new solutions serving clients and members (internal social network). Starting from Watson’s Natural Language Processing technology (IBM), Alliance Fédérale has developed an email analyser serving a threefold purpose, automatically identifying the request made in the email, identifying the urgency for the response, and preparing contents for the response. This AI tool identifies the intention of each text and its degree of urgency, and proposes responses to our advisors. This tool even responds to questions asked by our advisors themselves. This is a genuine virtual assistant: each of our advisors may ask a question, obtain an extremely fast response. They can therefore be more effective and more reactive, as our clients are expecting great responsiveness. Assisted intelligence is already a reality for more than 20,000 persons working within Crédit Mutuel. Finally, artificial intelligence has not destroyed one single job or eliminated one single agency within Crédit Mutuel, but on the contrary, has supported, facilitated, and accelerated the response given to clients and has increased client loyalty. Technology must remain a tool and may not replace human beings. In a case such as the Watson tool, AIis precious, as it supports the rational intelligence of our advisors. Crédit Mutuel intends to gradually generalise cognitive technologies in 100% of our business lines (conformance, insurance, payments, etc.). With other partners (Auchan, BNP, Carrefour, Casino, Total, etc. ), Crédit Mutuel has also developed solutions such as Lyf Pay proposing innovative, multi-service and secure mobile payment applications serving the client relationship. Developed with merchants and designed for consumers, the Lyf Pay application covers an extremely broad scope, including payment cards, loyalty cards (in-store payments, web-based purchases, payments between individuals or even gifts to associations, etc.). It is thus possible to rival US or Chinese mobile payment solutions (Alipay, WeChat Pay). By proposing the best of digital banking in its banking applications and services on all of its markets and business lines, the Group brings responses suited to its clients’ new behaviours and uses, in a highly secure framework. Mutualism means bringing about the success of clients and members.